How about the GOLDEN EAGLE JAZZ BAND who were with us once again at our Farnborough Jazz Club on Friday 25th April 2014? I know I’m just going to upset you though, if you missed them! Another fabulous evening of fun entertainment. The audience thoroughly enjoyed themselves, as did the band. Their leader, KEVIN SCOTT has a wonderful sense of humour all the time and I don’t know anyone who doesn’t love a laugh, as well as appreciating talented musicians giving their all. Kevin, who plays tenor banjo, had MIKE SCROXTON on trumpet, ALAN CRESSWELL on clarinet, ROY STOKES on trombone & vocals, MIKE BROAD on double bass and PETE JACKMAN on drums. Honestly, this is another wonderfully popular band. I mentioned last week that at one time, I had a quick peek into their own website, just to check name spellings [www.gejb.webeden.co.uk – click on ‘Home-The Golden Eagle Jazz Band’]. I had forgotten we had posted a comment to the band. Most likely adapted from our own website, but temporarily lost, so I asked you to check it out to remind yourselves of their very first evening here (when I get a moment, I’ll try to retrieve all lost newsletters from the past!). As for this Friday, I now have to decide what numbers to mention and it won’t be easy, as I picked so many! Well, they began the evening with ‘Red Wing’. Kevin introduced it, saying it had some reference to a battle tune – about the time of the American Civil War. Ken Colyar recorded it in 1955. What a great start! Then came a Paul Whiteman number ‘There’s Yes! Yes! In Your Eyes’ and was sung by Mike (another good jazz singer). I always love to mention ‘Ciribiribin’, whenever it is played, because when looking it up a couple of years back, I got to make contact with the person who helped Jack Lawrence (co-composer) to write one of his book. Jack was still writing to fans almost right up to his death aged 97yrs, brilliant. Colin Dobson and his wife Jo and family came to see the band. Colin being part of the trumpet section in the Billy Cotton Band Show (remember ‘Wakey, Wakey’ fame). The boys played Billy Cotton’s signature tune ‘Somebody Stole My Gal’. Mike sang it and of course we all sang along too. Anther tune well worth a mention was ‘Lord, Lord, Lord’, because they played it a storm, really swinging. I had written down ‘Brilliant’. They are a sitting band, but the front line (including Kevin) stood up to play mid-stream – quite effective. Alan was featured next with George Lewis’ signature tune ‘Burgundy Street’. Alan was superb (accompanied by Mike and Kevin), I don’t think there was a sound from the audience, whilst he played, but huge applause ensued. Another wonderful bit of fun was when they played ‘I Thank You Mr Moon’, because Mike sang the main part, with Kevin and Alan joining in doing their ‘Boswell Sisters’ act, definitely their party piece, ha. My last number to mention is ‘I Scream, You Scream, We All Scream for Ice Cream’. What a great job Kevin did singing it too and of course once again the audience joined in. Just a little added anecdote, before the audience arrived, I asked Kevin if he could give me a list of numbers they might be playing (so I could just put my remarks only). When he gave it to me, I said I don’t suppose you will stick to it, but it will help me, to which he replied ‘How very dare you’ (Katherine Tate style)! Mike chimed in with ‘I expect she wants to give it to George Tidiman’ – lovely humour. Anyway, wherever this band plays, be sure to go along. You certainly won’t regret it, they are such fun and very enthusiastic. Their next date with us is Friday 1st August 2014, please put a note in your diaries to come. We aim to please with ‘Live’ music. This entry was posted in Golden Eagle Jazz Band on April 29, 2014 by Diane. PHOENIX DIXIELAND JAZZ BAND certainly entertained us on Easter Good Friday, 18th April 2014 here at the Farnborough Jazz Club. We received a few phone calls during the week, from people who haven’t been before, checking if we had jazz on Friday, being Easter. They also asked if it gets busy, but as we told them, Good Friday is always an unknown quantity, as it is ‘family time’. Many people go away, or have their family come to stay and can’t get out to the jazz. So it was nice to have a wonderful turnout – always nice for a band to have a decent crowd to play to. Leader ROBIN COOMBS had his excellent line-up with PAUL HIGGS on trumpet, BILL TODD on trombone, DAVE BARNES on piano, ROGER CURPHEY on double bass, JOHN STUART on banjo & guitar and ALAN CLARKE on drums. Last week, I suggested as the weather is beautiful, to do your gardening during the day, then mosey on over to us for some enjoyable dancing to jazz. Beautiful, because looks like you all took heed of me, hmmm. Once again, Robin was a little worried the dancing didn’t commence straight away, but it does always takes a drink (or two) to settle in and it wasn’t long before we were all up and leaping about. Anyway, it is nice to just listen as well, especially with such tunes as Benny Goodman’s ‘A Smooth One’ and ‘You Took Advantage of Me’. Another number, sung by Bill, was ‘I’m Confessin’ That I Love You’ and I noted Paul played lovely (muted) trumpet. Bix Beiderbecke’s hit, ‘At the Jazz Band Ball’, certainly was one for the ‘fast’ dancers, super. A tune definitely worth a mention was ‘The Charleston’ to which our line-dancers performed a Charleston dance – well, sort of! Then Paul gave a wonderful intro to ‘West End Blues’ (famed by Louis Armstrong) with solos fabulously played by everyone. Next, I noted one of Chris Barber’s hits called ‘Stevedore Stomp’ to which they all played brilliantly, again bringing on the dancers. Dave sang ‘Fats Waller’s ‘Twenty Four Robbers’. He introduced it and demonstrated to us the words to join in with, and of course, being a rum lot, we all did – great fun. Jack Teagarden’s famed ‘A Hundred Years from Today’ came next. It is a favourite of Keith’s and a lovely foxtrot for the slow dancers. A perfect evening and surely must have set everyone up to face the rest of the week (well it did for me). One last thing, something for your diary, the band’s next date here is to be 25th July 2014. This entry was posted in Phoenix Dixieland Jazz Band on April 17, 2014 by Diane. 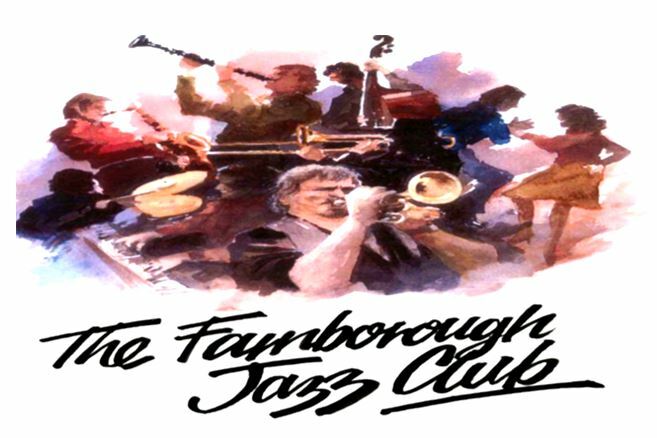 MAHOGANY HALL STOMPERS played here at FARNBOROUGH JAZZ CLUB on Friday, 11th April 2014. We had a great crowd to greet them. Band leader BRIAN GILES (cornet) booked BRIAN WHITE on reeds, GEORGE ‘KID’ TIDIMAN on trombone & vocals (yep, he was here with his own band last week), ‘SOUTHEND BOB’ ALLBUT on banjo & vocals (and yes, right again, he was also here last week), JOHN BLENHEIM on drums and EDDY JOHNSON on double bass. Once again, a super atmosphere making it an enjoyable evening with plenty of dancing. Now, I’m sure you would like a little taster of tunes we were treated to, yes? The fact that we were busy, I was unable to jot down the first couple of numbers, but I remember ‘Pretty Baby’ was sung by Bob. I have often mentioned before, Bob has a super voice, not dissimilar to Hoagie Carmichael, but deeper, what I describe as a fantastic ‘round’ baritone sound, do you know what I mean? The next tune was a big ‘Number One’ hit of Tommy Dorsey, namely ‘On Treasure Island’ and the ‘Mahogany boys’ certainly did this number justice. Another excellent number was ‘Big Chief Battle Axe’ (of Bunk Johnson fame), which encouraged plenty of dancing. They also played ‘On the Sunny Side of the Street’, sung by Bob, which enticed the audience to sing along (I think almost everyone knows most of the lyrics, both young and old). Next I recall Brian saying “let’s have some Fats Waller” and ‘I’m Flying High’ was his choice (it certainly should be a signature tune for Keith – ha). Bob sung the next number that has some brilliant lyrics. The number was a Jelly Roll Morton famed one, called ‘Michigan Waters Blues’. The lyrics say something about Mississippi waters tasting like turpentine! (I just love the diversity of the numbers Bob sings). This time ‘I Want a Little Girl to Call My Own’ was sung by George (another great voice) and then Bob sang the next number, ‘Blues my Naughty Sweetie Gives to Me’ (made famous by Sidney Bechet). It was certainly a very happy evening. Please note they are to return 13th June 1014. This entry was posted in Mahogany Hall Stompers on April 17, 2014 by Diane. This entry was posted in George 'Kid' Tidiman's All Stars, Uncategorized on April 4, 2014 by Diane. ‘BOB DWYER’S BIX & PIECES’ produced some lovely entertainment for us on FRIDAY, 28th MARCH 2014 here at the FARNBOROUGH JAZZ CLUB. They are such a popular band, with leader BOB on trombone & vocals, MAX EMMONS on trumpet, harmonica & vocals, BERNIE HOLDEN on clarinet & sax, HUGH CROZIER on piano & vocals, JOHN BAYNE on double bass/bass sax, NICK SINGER on banjo & vocals and (band leader from last week) LAURIE CHESCOE, on drums, whistle & grins of course. I said last week, they always create a great atmosphere and they surely did! Bob has a beautiful voice and he demonstrated that fact when he sang ‘Why don’t You Go Down to New Orleans’ (there is a Leroy Jones version on YouTube). They played ‘Alexander’s Ragtime Band’. Obviously we all sang and danced to this Irving Berlin one [10wks @#1 for duet Arthur Collins & Byron Harlan], I remember Johnny Ray’s version, do you agree? A Bix Beiderbecke number, called ‘River Boat Shuffle’, was my next number to mention. I had written down ‘a brilliant fast number’. Hugh sang the next tune ‘Hard Hearted Hannah’. He sang it softly, with such feeling. Bob sang the next number, ‘The Song is Ended (But the Memory Lingers On)’. Then he sang a number called ‘Nice To Know You Care’. It was written by a dear friend of ours, Leslie Baguley (30 years ago, Keith played drums with him regularly). A while ago, Keith told Bob about this number, asking him to sing it one day. 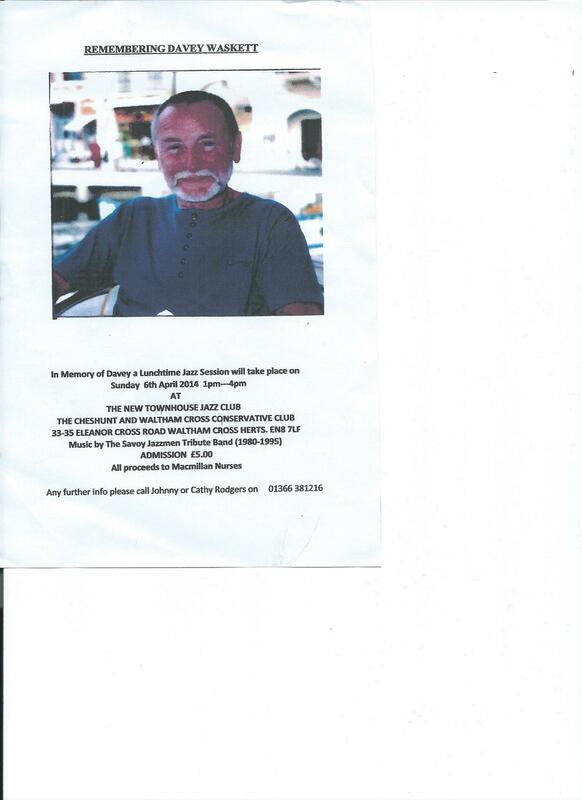 It was lovely to hear it performed again (please read special tribute page for Leslie Baguley). ‘(What Did I Do To Be So) Black and Blue’ was another terrific number they performed and sung by Bob. I wrote down that Max sang and what a powerful jazz voice he has. ‘Puttin’ On the Ritz’ brought on the line dancers, well, four (oh dear). Anyway, a great number. The next one is a great favourite of ours by Bob’s band, which was ‘Freight Train Blues’. They sound so like a train – just brilliant, with Max playing harmonica to the tune and the rest of the band making great train-like sounds fabulous. Hugh then featured on piano with a number called ‘The Pearls’ by Jelly Roll Morton. JRM is said to say it was one of his most difficult composition to play, so well done Hugh. There’s nothing like ‘live’ music, bring a friend when you come next week for George ‘Kid’ Tidiman’s All Stars! This entry was posted in Bob Dwyer's Bix & Pieces on April 4, 2014 by Diane.